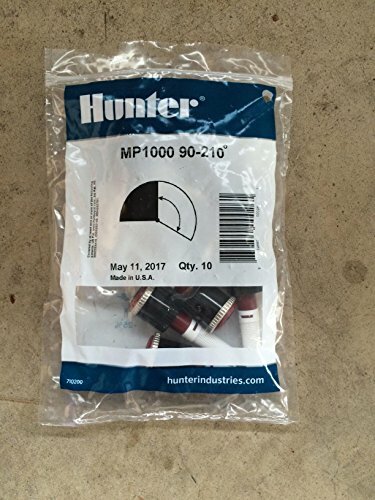 This listing is for 10 pcs of Hunter MP1000 90-210 degrees rotator. The revolutionary MP Rotator features a unique, multi-trajectory rotating stream delivery system that achieves water-conserving results. Rather than simply "spray" water onto landscapes, MP Rotators deliver multiple streams of water at a steady rate. This slower application rate allows water to gently soak into the soil and achieves an even distribution throughout the area being irrigated. This increased efficiency results in 30% less water use when compared to traditional sprays and significantly reduces wasteful runoff. The MP Rotator can be installed onto any conventional spray head body or shrub adapter, transforming them into high uniformity, low precipitation rate sprinklers with matched precipitation at any arc and any radius. The MP Rotators are a great choice for new systems, as they provide immense range flexibility (from 5' strip to 35' radius), decrease material costs, and provide better system efficiency. MPs are also perfect for revitalizing older systems-a retrofit can solve both low pressure and poor coverage problems. If you have any questions about this product by MP1000-90-210, contact us by completing and submitting the form below. If you are looking for a specif part number, please include it with your message.